Located in the few blocks sandwiched between downtown Palm Springs and Ruth Hardy Park, Movie Colony real estate is some of the most luxurious in the city. The historic estates, multi-million dollar mansions, and high-end single-family homes that line these well-maintained streets were once the houses of some of Hollywood's most famous stars. Close to several Palm Springs schools, the vibrancy of the downtown core, and top recreation destinations, this neighborhood is one of the most desirable in the city for good reason. Begin your search for Movie Colony real estate below, or discover more about what makes this Palm Springs neighborhood unique. For unlimited access to active Movie Colony homes for sale listings, sign up to become a member. As a member, you can also create custom searches to pinpoint exact property types you're searching for and it only takes a minute to get started. This central community is the site of some of the oldest homes in Palm Springs. In fact, you'll find construction dates as early as the late 1930s. As the name of this distinctive neighborhood suggests, this area was once the chosen locale of Old Hollywood's most famous. 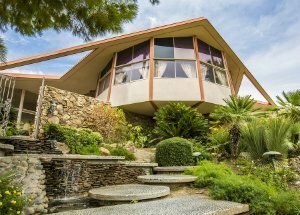 Cary Grant, Marilyn Monroe, and Dinah Shore all once called this community home. Properties along these streets may be old, but they have been lovingly maintained and frequently updated over the decades so that they have kept up with the times. One unique feature of this community is the manner in which each estate is enclosed by white stone walls for optimum privacy. Exteriors adopt a diverse range of architecture styles ranging from the clean white lines of the mid-century modern home to the tile-embellished Spanish home, to the relaxed manner of the California Rancher. Inside, you'll find each home has their own unique character. Some subscribe to an LA loft aesthetic with rough-hewn wood beams by the ceiling, exposed brick walls, and barn doors on sliders. Others are classic Palm Springs with floor-to-ceiling windows, open-concept designs, and an emphasis on white interiors. The design of these homes were built to encourage residents to reconnect with nature. Others embody classic Spanish architecture with warm desert hues and corrugated terracotta rooftops. The biggest perk of purchasing a Movie Colony home for sale is the location. These properties are walking distance from Downtown Palm Springs downtown where you'll find a hub of art and culture. Well known for its artist community, there are over a dozen art galleries along Palm Canyon Drive alone. Gré Coffeehouse and Art Gallery features the works of brother-sister team, Gré and Joe Segré, and has a cool beatnik vibe and stays open late. Shag features the works of painter, designer, and illustrator Josh Agle. Michael Weems Collection features unique works that repurpose car exteriors to make modern art. In the downtown corridor, you'll also find top eateries, one-of-a-kind boutiques, and hip desert bars and clubs. Has your interest been piqued by a Movie Colony home for sale? Contact me to get more information about specific listings, book private viewings, or get expert advice on the Palm Springs real estate market.